Why send potential clients a boring business card when you can send them a small gift? A magnet is a great way to promote your business and cultivate a relationship with existing customers. 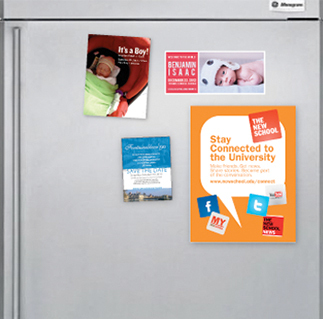 Recipients will use your custom magnet to secure cherished photos on their lockers or refrigerators, enabling your brand to instantly become incorporated into their lives. Avanti Printing provides magnet printing services in our Orange County facility, located in Irvine California. Our full color magnets are not only durable, but provide striking and stunning full color images and designs. Invest in our custom magnets to promote your business in a long lasting way. Our magnet printing services will not only satisfy you, but will aid in securing new clients and building awareness for your brand. We offer many options for magnets printing. Choose from standard shapes, such as square, rectangle business card shapes. Custom shapes can be created specifically for your business. This allows you to express your creativity and the shape can match your business, such as a house for a realtor or a car for a repair shop. You can use our stock images or your own unique graphic in full color ink with contact information of your business or an event you are promoting for magnets printing. Upload your own logo and create a design for magnet printing with our online design center. We also offer custom magnet design services. We can help by editing existing artwork or creating unique art for your magnets. Request a quote on our website or contact us by telephone. Request A Quote For Magnets Today!